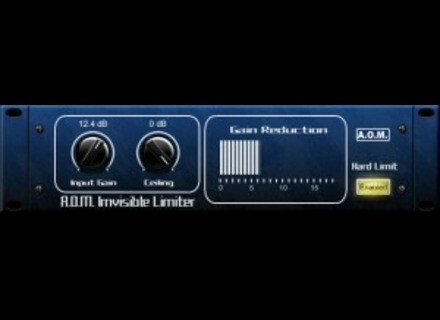 Invisible Limiter, Software limiter from A.O.M. Factory. A.O.M. Factory has released version 1.3.1 of its Invisible Limiter, Stereo Imager D, and Wave Shredder effect plug-ins. Support for AudioUnit format on Mac OS X.
Bug fix: Crash when plug-in window is rapidly switched. Bug fix: GUI doesn’t follow parameter change from automation. Invisible Limiter and Wave Shredder are available to purchase for $38 USD each, Stereo Imager D is $28 USD. For more information, visit the A.O.M. Factory website. EAReverb Group Buy Extended eaReckon has announced that EAReverb has been updated to version 1.1.6 and that the EAReverb Group Buy subscription period has been extended and will now end on June 2nd, 2011. Kuassa Updates Amplifikation One Kuassa has updated Amplifikation One to Version 1.2.2. Sinevibes Updates Dynamo, Turbo & Turbo S Sinevibes has updated its Dynamo, Turbo, and Turbo S, AudioUnit plug-ins.